The history of VF-114 began with the creation of Bombing/Fighter squadron one-nine, VBF-19, on the 20th of January 1945 at NAS Alameda. Witin a short space of time the Aardvarks had moved to NAS North Island. Early equipment was the F6F Hellcat, followed by the F4U-4 Corsair. As with many squadrons in the post war period VBF-19 had its designation changed on several occaisions in quick succession. The first change was to drop the bombing role, becoming VF-20A on the 15th of November 1946. Just under tow years later, on the 24th of August 1948 they became VF-192. The final change was on the 15th of February 1950, when VF-192 became VF-114. In this early period VF-114 were known as the Executioners, rather than Aardvarks. VF-114 took part in the Korean War, deploying aboard the USS Philippine Sea (CV-47) from the 5th of July 1950. Flying their Corsairs for several months of the war the squadron took part in over 1100 strikes against the North Korean and Chinese forces. After returning from Korea VF-114 moved from props to jets, at first flying the F9F Panther. This was shortly followed by the more capable, all weather F2H Banshee. A few years later, in 1957, VF-114 was introduced to the F3H Demon, from McDonnell. This was their first aircraft capable of carrying air-to-air missiles. In the four year association with the Demon VF-114 made two cruises with the type, both from the deck of USS Shangri La (CVS-38). 1961 was an important year for the squadron, as they were introduced to the McDonnell Douglas F-4B Phantom II. VF-114 were the first Pacific Fleet squadron to acquire the Phantom II. Apparently it was the resembelance between the McDonnell fighter and the BC Comics cartoon character Zot that inspired VF-114 to change their name and insignia to an Aardvark, the change happening in 1963. At some point the squadron had 2ft replica of Zot created, which was proudly displayed in the squadron's ready room and guarded dilligently against intruders from other squadrons. VF-114's first Phantom II deployment began in September 1962, as part of CVW-11, onboard the USS Kitty Hawk (CV-63). Between 1961 and 1976 VF-114 made a total of five combat cruises to Vietnam, gaining five MiG kills in the process. Also at some point during this period they transferred from the F-4B to the more advanced F-4J variant of the Phantom II. The Phantom period finally ended on the 15th of December 1975, when the first F-14A Tomcat arrived. Transition took slightly over a year, being completed upon the 1st of January 1977. In October of that year the first F-14 cruise took place, once again on the USS Kitty Hawk, and continued into 1978. This cruise was to the Western Pacific and saw VF-114 once more a part of CVW-11 and with sister squadron VF-213. March 1979 saw the whole of CVW-11 deploy onboard the USS America and take part in a Mediterranean cruise, something of an oddity for a west coast based air wing. Even more unusual was that a second cruise followed in 1981. On both of these deployments VF-114 captured the Golden Tailhook award, an award given to the squadron that has the highest landing score for the cruise. In the gap between cruises VF-114 gained another award, winning the West Coast "High Noon" aerial gunnery competition. 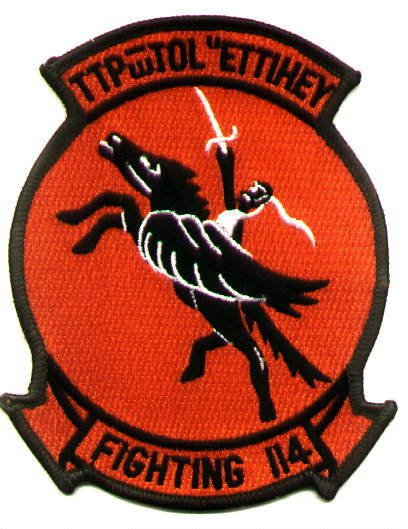 The Aardvarks also won the Mutha trohpy for 1982, signifying them as the Pacific Fleet's best fighter squadron. After their two Mediteranean cruises VF-114 returned to the Pacific, deploying in September of 1982 onboard the USS Enterprise (CVN-65). During this cruise VF-114 participated in one of the largest naval exercises since the Second World War, when it hooked up with the carrier groups of USS Midway (CV-41) and Coral Sea (CV-43) in the Northern Pacific for two weeks. Returning from the cruise Vf-114 kept up its high tempo, once again winning the "High Noon" and Mutha trophies, the first time that an F-14 squadron had won both awards two years in a row. The next deployment was again on Enterprise, beginning on the 30th of May 1984 and returing on the 20th of December. During the cruise the squadron and airwing took part in severla exercises, the RIMPAC exercise off Hawaii and exercise Beacon Flash in the North Phillipines. Once again the Aardvarks took part in a Fleet exercise in the Northern Pacific, this time with the carriers USS Midway (CV-41) and Carl Vinson (CVN-70). The vast majority of 1985 was spent ashore at NAS Miramar training for their next deployment, but this by no means mean that the Aardvarks were having a break. th early months saw much air combat maneuvering training, both against fellow Navy crews and aircraft from the Air Force and Marines. The latter months saw airwing training move into high gear and included carquals onboard the USS Enterprise. The 1986 cruise began on the 12th of January and saw CVW-11 back with the Enterprise. The first part of the deployment was to the Western Pacific and included stops at Pearl Harbor and Subic Bay in the Phillipines. Continuing on into the Indian Ocean VF-114 had a busy time, often intercepting and shadowing Soviet and Indian aircraft interested in the Task Force. During this time tension with Libya was high and after the airstrike by Atlantic Fleet planes on the 15th of April the decision was made to move the Enterprise and Battle Group Foxtrot into the Mediteranean. To reach the Med Enterprise transited the Suez Canal, becoming the first nuclear powered aircraft carrier to do so. Once at the "Line of death" CVW-11 aircraft flew patrols for two months, although encounters with Libyan aircraft were few and far between. One advantage of being in the Mediterranean was that the crews got to experiance a variety of rare port calls, visiting Naples and Toulon. Instead of returning via the Suez Canal the Enterprise battle group transited the Gibraltar Straits, then cruised around the southern cape of Africa before continuing onto Perth, Australia. From there they cruised back across the Pacific into port. As with 1985, 1987 was mainly devoted to training for the next deployment. this heavy schedule included two deployments to NAF El Centro (or as it is often referred to, El Sweato). The whole airwing assembled at NAS Fallon to train on the huge ranges there, allowing practice of fully integrated airwing tactics. In August the Aardvarks once again won the Mutha trophy, an achievement that was topped with their later winning of the Pacific Fleet Battle 'E' for excellance. 5th of January 1988 saw the Aardvarks once more take to the high seas, once again as part of CVW-11 onboard the Enterprise. Most of this cruise was spent in the Persian Gulf however, escorting reflagged tankers through the Gulf for most of March, April and May. The problems were due to the ongoing tanker war, part of the larger Iran-Iraq war. In April the squadron provided top cover for airstrikes against Iranian oil platforms as part of Operation Praying Mantis. By February 1989 the carrier had returned to port and VF-114 began a compressed turnaround schedule, due to their next cruise beginning in September 1989. Even with the restricted time period VF-114 were able to fit lots in, deploying to NAF El Centro for FFARP (Fleet Fighter ACM Readiness Program) and as part of the airwing to NAS Fallon. Once onboard the Enterprise an around-the-world cruise began as the battle group took part in exercises around the globe. October saw VF-114 set a new flight record for an F-14 squadron, logging more than 811 hours in a single month. The end of this cruise saw the end of CVW-11's long attatchment to the USS Enterprise, for their next cruise was to be on the Pacific Fleet's newest carrier (at that time), the USS Abraham Lincoln (CVN-72). VF-114 arrived onboard the Lincoln on the 25th of September 1990, while she was making her maiden voyage from Norfolk to Alameda, due to become her new home. The trip took six weeks and saw the carrier cruise round the tip of South America, arriving at her new home in late November 1990. The first long term deployment on Lincoln began in the middle of 1991, during the early part of the cruise the carrier and air wing were involved in the evacuation of thousands of military personnel and dependents from the Phillipine Islands in the wake of the Mt. Pinatubo eruption. Once this was complete the Lincoln headed for the Persian Gulf. Although the initial plans had been for the Lincoln to be among the first relief carriers for those involved in 'Desert Storm' by the time of her arrival the conflict was over and VF-114, along with the rest of the air wing, was instead heavily involved in post ceasefire combat air patrols. The Aardvarks flew many hours over a burning Kuwait, seeing first hand the astounding landscape created by thousands of burning oil wells. Like almost half of the F-14 community VF-114 was disestablished, the ceremony happening in April 1993. When initially delivered VF-114 aircraft had bright markings, featuring several areas of bright orange, as can be seen upon the graphic below. As markings became more toned down the bright orange fuselage sash was lost, although occasional aircraft saw it reinstated in dark grey. The Aardvark on the tail also went from orange to grey. There have been some colourful markings however, at least one F-14A having been seen with a red Aardvark upon a gloss black tail.